Microsoft released non-security updates for the Office suites Microsoft Office 2010, Microsoft Office 2013, and Microsoft Office 2016 on the February 2018 Office Patch Day. The first Tuesday of each month is Office Patch Day at Microsoft but the company limits the releases to non-security updates. Security updates follow on the second Tuesday of each month. Please note that the updates apply not to click-to-run installations of Microsoft Office, for instance Office 365 Home, but only to msi-installer-based editions. I recommend that you don't install the updates directly unless you are affected by one of the described issues. 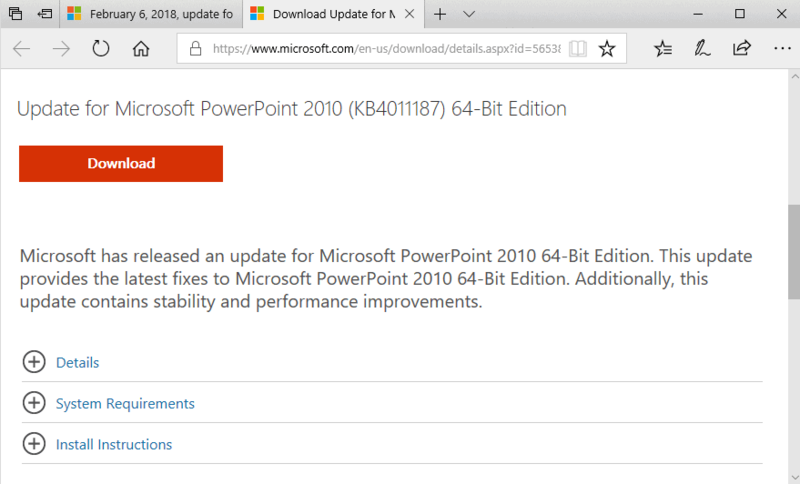 KB4011187 -- The update addresses an issue in PowerPoint 2010 which saw files open slower than before after installing the Windows 10 Fall Creators Update. KB4011191 -- Same as KB4011187 but for PowerPoint Viewer 2010. KB4011700 -- The update fixes an issue in Excel with values going to the wrong worksheet after switching sheets from a Microsoft Visual Basic for Applications (VBA) user form. KB4011646 -- Fixes a crash issue that "occurs when a chart contains a filtered out series that has percentage data labels". KB4011676 -- Fixes the same issue as described in KB4011187. Also includes improved translations for terms in the Estonian and Korean version of Microsoft Office 2013. 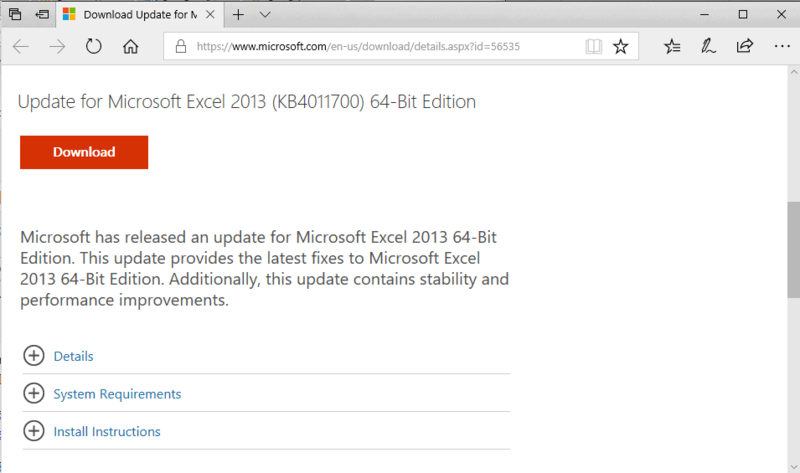 KB4011679 -- The update fixes three issues in Microsoft Project 2013. A issue where MOD_DATE properties have the same value even though they should not, a issue with tasks that have splits in them, and one where values of custom fields may be lost. KB4011678 -- Update for Skype for Business 2015. KB4011684 -- Addresses two issues in Excel 2016. One that is addressed by KB4011700 for Office 2013, and another that resolves that the drillthrough action with CubeValue function does not work in Excel 2016. KB4011664 -- Only two or three Office add-ins are displayed in the Office Store at a time. The update corrects the behavior so that more add-ins are displayed. KB4011668 -- Fixes the same issue as described in KB4011646. KB4011685 -- Fixes an issue on Windows 7 where the recent documents list is not populated if the regional setting is changed to select Spanish regional variants (Colombia, Dominican Republic, Guatemala, Mexico, Panama, Uruguay). Resolves an issue in Outlook where changes made to Outlook contacts were not saved. KB4011566 -- Improves translation of some terms in Office products to make sure the meaning is accurate. KB4011571 -- The update fixes a quota issue in the German version of OneNote 2016 and adds a property to enable pages to be set to read-only. KB4011663 -- The PowerPoint 2016 update addresses the issue described in KB4011187 for Office 2010. It furthermore resolves an issue that returned the error message Run-time error 0x80048240, and a crash in Presenter View when presenting a slide on two monitors in Duplicate mode, and updates the translation of the Estonian and Korean version of PowerPoint 2016. KB4011672 -- This update addresses several issues in Project 2016. It fixes an issue with custom field values being lost, a timesheet issue where work may be split over the whole duration, and the error messages " This field only supports numbers. If you’ve only typed numbers, try entering a smaller number with up to two decimal places", and "The date you entered isn't supported for this field. Dates must be between January 1, 1984, through December 31, 2149. Enter the date in the correct format, eg., 15/06/00 or 15 June 2000". KB4011681 -- An update for Word 2016 that fixes the following three issues: numbering in right-to-left texts is displayed in incorrect fonts, missing sentences in a Text Form Field in a Word printout after upgrading to Office 2016, incorrectly displayed file names in the Info pane when you clear File name.extensions options in File Explorer. KB4011662 -- Update for Skype for Business 2016. It looks like Office 2007 reached end of life and became unsupported on October 10, 2017. Yes but there was several security updates on Office 2007 on 01/08/2018 in Windows 10 and others, I guess. It was the reason of my question. A lot of people still have and use Office 2007 or maybe older versions. Recent versions are too expensive and they are not informed about the existence of LibreOffice. Thanks like every month for this not only well written, highly informative but also ferry helpful article. Do I understand it correctly that Windows Office 2010 has an update lifespan from two more years? Yes, that is right Paulus.